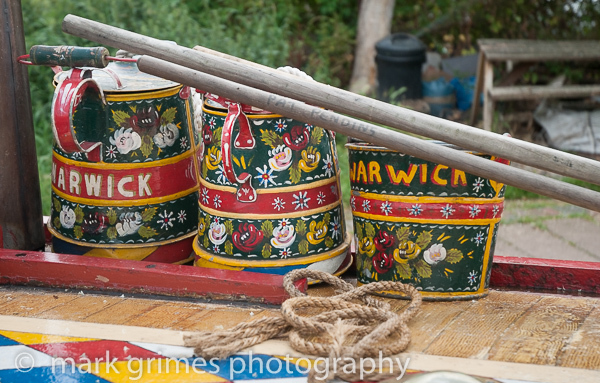 A collection of water cans on top of the narrowboat “Warwick” moored outside the Cape of Good Hope pub. I thought you might be interested in how this picture was the inspiration for a friendship between two boaters. As has been the tradition for a few years now, I was enjoying my boating holiday aboard a lovely hired cruiser in August. The sun was shining and I was happily navigating my way along the River Thurne in the beautiful area known as the Norfolk Broads. Prior to this holiday, I had been told about your website by a canal enthusiast friend and had shared the details with my wife, who is also a lover of all things canal. On this particular day she happened to be on your website, enjoying the images on her laptop. She was particularly taken with the Patent Pending image, and hurried over to the captain’s seat to show me what had so impressed her. As she placed the laptop before me, i was immediately captivated by the beautiful colours and the simple but stunning portrayal of canal life. Alas, my enthusiasm for this picture was such that I had taken my eye off the wheel and allowed the vessel to drift into the path of another boat. Although I heard a faint warning shout, it was too late to prevent a collision: it took the inevitable thud of the bow to wake me from my daydream of appreciation for your picture. Luckily we weren’t travelling too quickly-around 3mph-so the damage was just cosmetic. The other boater was not very happy though, and he justifiably admonished me for my lack of attention. Some of his words were quite choice and won’t be repeated here! However, and here’s the point of the story, this boating mishap was to have a quite delightful ending, and all thanks to your fateful picture. It transpired that the owner of the other vessel was a canal lover and when he realised the reason for my lapse of concentration, was completely forgiving about the outcome. Indeed, when he took sight of the Patent Pending image, his first words were ‘Ain’t that a real beauty, no wonder you got distracted!’ It wasn’t long before the other photos in your collection were being viewed and avidly discussed by two canal enthusiasts, and the mood remained buoyant for the rest of the afternoon…it soon became a case of friendship ahoy! So, I would just like to thank you for this simple twist of fate in which your phenomenal ability was a catalyst for both forgiveness and the forming of a river and canal-based alliance that has continued since that first collision! This is a delightful picture in which you have captured the colours most beautifully. I wholeheartedly endorse the thoughts of the previous poster, especially the point about achieving the right colour balance: the mark of a true professional. I would say that this image represents an authentic slice of canal life, and even the blurred background clutter has a function in directing the viewer’s vision to the foreground-a clever technique. You have used what I would call ‘maximum economy’ in this shot; whereby the scene is very tightly constructed and the emphasis is clearly on the main feature i.e. the watering cans and their distinctive hue. The rope is a nice touch and I find myself in complete agreement with the idea that it represents everyday toil on the canal network. The rods, rather than causing any distraction, add an extra layer of interest to the photo. I also appreciate the humour in the shot, with your naming it after the writing on one of the rods. Very inventive. A most commendable effort that really showcases your talent for scene creation and storytelling. Thank you so much for replying to my comments. It really is delightful to know that there are similar minded people out there who are deeply moved by artwork of this depth and nobility exhibited by the creator. After I left my comments, I was deeply concerned, to the point of a sleepless night, that I had overstepped the mark of exegesis into eisegesis (to use a theological metaphor!) when I commented upon the coiled rope and its association with toil and labour, as represented by its worn texture exhibited here. One can almost sense the callouses from the well worn hands that have handled it over the years! At least that’s how I felt upon looking upon this work. And it is truly gratifying to know, that I do not stand alone in my opinion, as I had feared I might on the sleepless night following the posting of my comment. I must congratulate you on the observation you have made on the genius at work respecting the name of the photograph. I refer to your brilliant observation regarding the inspired decision of the photographer to name the photo after the writing discreetly inscribed along the lateral edge of one of the rods. We can both agree, this is a work of art of the most wonderful calibre. Not very often am I rendered speechless, but your photo has induced a sense of wonderment that has left me unable to utter words in the usual manner. Good job I have the option of writing and posting my thoughts! This image could so easily have turned into one of those dreadful ‘riot of colour’ photos that are frequently the preserve of the amateur point and click photographer. You, though, somehow manage to convey and capture this symphony of light without the usual kaleidoscopic effect that would have otherwise caused me to insist you make a black and white version of this graphic portrayal of watering cans and buckets. The coiled rope is a powerful addition that could have easily been set aside, conveying a sense of manual labour and the very suggestion of many calloused hands having worked it is most striking indeed. I am not entirely sure what you call the broom handle type rods but their declivitous manner adds a feature of subjective ascension or decline that is entirely dependent upon your point of view. A photo that enables the beholder to read his own interpretation into the work is, in my opinion, what always makes for the most splendid of shots, and is, in a nutshell, art. Congratulations on achieving this beautiful scene so elegantly for all the world to view.